Is a next-generation printer the solution your organization needs? Many business owners, approaching their processes with the fresh perspective a new year offers, might say yes. But this approach – adding more or better printers to your existing print fleet – isn’t always the best way to go. Remember that a printer’s overall cost is more than its price tag would indicate – you automatically assume responsibility for keeping your printers filled with paper and ink or toner, and those costs carry on for as long the printer is in use. Using a managed print service program to control costs while obtaining optimal usage out of your existing print fleet can be a more advantageous approach, especially with modern print analysis techniques. However, finding the right program means knowing what to look for when you search for managed print providers. What Do Managed Print Service Programs Do? 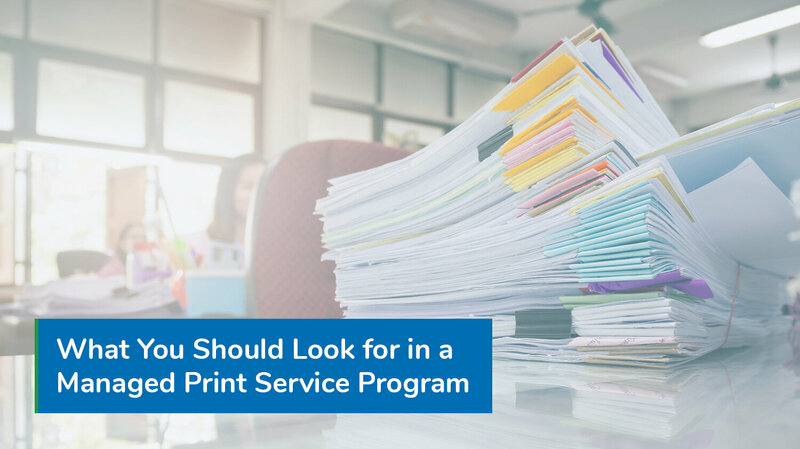 The point of this program is to get the most out of your current print fleet. This means reconfiguring your hardware to make efficient use of resources in multiple ways. If you are considering outsourcing your printing needs to a third party, you should look into the ways they accomplish the following feats. Offering Scalable Predictability. The main benefit to managed services is that you turn widely variable costs into stable, monthly subscriptions. This lets you turn costs, like printing and document management, into active assets that boost your bottom line without cutting into your budget any more than you let them. Analyzing Routine Print Needs. Can your IT department perform a print analysis using the tools you have on-hand? Even if they can, it might not be the best use of their time. A managed service provider can analyze your needs on a daily, weekly, monthly, and annual level, adjusting the print services they offer to meet those needs in real-time and charging you a fixed cost per page in return. Reducing Reliance on Local Printers. Local printers are generally the crux of inefficiency in business environments. An example of a local printer is a small executive desktop device only used by a department supervisor. These devices usually require unique cartridges and are rarely networked, making them cost more than what they’re worth in the long run. Streamlining Placement of Printers. Have you considered how much time your employees spend waiting for printing, scanning, or copying tasks to complete? In business environments, these tasks can become production bottlenecks that a managed print service can open up by allocating the appropriate resources to the appropriate departments based on recurring needs. Replacing Inefficient Devices. All printers are not equal. In fact, variations even exist between printers and multifunction devices of the same make and model – a managed print service program provider can assess these differences using real-world usage statistics and determine which devices are underperforming. Then, they may replace those devices with ones better suited to the environment at hand. Delivering Supplies On-Time. In today’s busy commercial landscape, there is no excuse for downtime due to a lack of printer consumables. Managed print services ensure that you always have a reliable stock of printing supplies in stock and that new shipments arrive right when you need them, maximizing the use of available office space while reducing waste and eliminating downtime. What Should You Ask for from Your Program? Everything mentioned above should be a part of any professional managed print service. However, the programs that represent the greatest value do more than just augment your existing fleet and optimize print resources. An end user-oriented managed service provider will also train your employees on how to use new technology and how to implement the latest cybersecurity standards in practice. Expert technicians will work with your employees to determine the best way to implement standard practices in your actual workflows, rather than just offering a one-size-fits-all solution that may not really fit your existing business model. You should also ask how your managed print provider handles remote printing. Will you be able to use mobile printing from your employee’s personal devices? Whether there is a policy for it or not, your workplace is essentially a Bring Your Own Device (BYOD) environment, and you need to put steps in place for ensuring that employee and customer data is securely handled by every element of your infrastructure. A professional managed print service program addresses these issues while offering 24/7 technical support that you can count on. These services need to be as scalable as the rest of the managed service itself is, so that you can count on getting help from your vendor when you need it most, regardless of the issue at hand. Contact Donnellon McCarthy Enterprises for more information on how a professionally managed print service program can help you boost office productivity.